We want to take a moment to thank you for your hard work this past school year! We know how challenging working in education can be, and we hope that over the coming weeks of summer you will be able to find some time to rest and get rejuvenated for the start of another exciting new school year. Although the end of the school year has arrived, most people not working in the education industry are unaware how busy summers are for superintendents and their administrative teams preparing for the new school year. As you work towards balancing your budgets, hiring new employees, negotiating bargaining contracts, and finishing ongoing maintenance projects at your facilities, we at edTactics want to let you know we understand the challenges you face on a daily basis throughout the entire year. 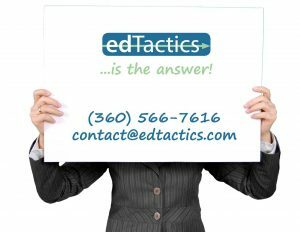 edTactics helps school districts implement and execute Community-Based Program and Facility Advisory Teams using our proven Continuous Improvement Model for Community Outreach. We know school districts because we come from school districts. edTactics’ success stems from our associates’ professional experience working as school superintendents and program directors for decades. We know the ins and outs of school operations because we’ve been there… just like you. Call us at (360) 566-7616 for a free consultation to discuss both your district’s present and future needs. If you prefer, you can also reach us via email. Email us using our online form.